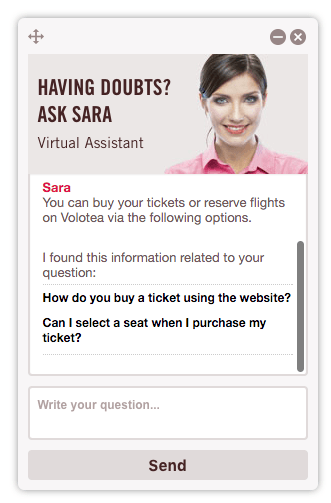 Our virtual assistant, InbentaBot, will enhance your customer service experience even more when you add hybrid chat. For example, if a customer isn’t finding what they need, the InbentaBot Avatar will instantly open a conversation with your live support agent, transferring all of the details of the conversation up until that point. This flexible option keeps the entire experience fluid for both customer and your support staff, to ensure a positive outcome every time. Using Inbenta Hybrid Chat, your customers who seek help support will immediately see an interactive “help” window appear on the homepage of your website. Once engaged, they’re greeted by your InbentaBot Avatar, which can be programmed by us to speak questions and responses. As your customer begins typing their question(s) into the chat box the InbentaBot accesses your knowledge base to find the most relevant answer(s) based on NLP. If your customer is satisfied with their search results they simply close out of the chat box window and continue their journey. If the InbentaBot is unable to help them find what they’re looking for, the hybrid chat feature connects them to one of your live support agents. Instantly the full conversation is sent to the live agent so they can pick up the conversation where it left off in the original search. The customer never has to repeat themselves and the experience ends with a positive outcome.